Dupuytren’s disease (also referred to as Dupuytren's contracture) is a common condition that usually arises in middle age or later and is more common in men than women. Firm nodules appear in the ligaments just beneath the skin of the palm of the hand, and in some cases they extend to form cords that can prevent the finger straightening completely. The nodules and cords may be associated with small pits in the skin. Nodules over the back of the finger knuckles (Garrod's knuckle pads) and lumps on the soles of the feet are seen in some people with Dupuytren's disease. The cause is unknown, but it is more common in Northern Europe than elsewhere and it often runs in families. Dupuytren's disease may be associated with diabetes, smoking and high alcohol consumption, but many affected people have none of these. It does not appear to be associated with manual work. It occasionally appears after injury to the hand or wrist, or after surgery to these areas. Dupuytren's disease begins with nodules in the palm, often in line with the ring finger. The nodules are sometimes uncomfortable on pressure in the early stages, but the discomfort almost always improves over time. In about one affected person out of every three, the nodules extend to form cords that pull the finger towards the palm and prevent it straightening fully. Without treatment, one or more fingers may become fixed in a bent position. The web between thumb and index finger is sometimes narrowed. Contracture of fingers is usually slow, occurring over months and years rather than weeks. There is no cure. Surgery can usually make bent fingers straighter, though not always fully straight; it cannot eradicate the disease. Over the longer term, Dupuytren's disease may reappear in operated digits or in previously uninvolved areas of the hand. But most patients who require surgery need only one operation during their lifetime. Published evidence does not support the use of radiotherapy. Injection of collagenase is helpful in some cases. Fasciotomy. The contracted cord of Dupuytren’s disease is simply cut in the palm, in the finger or in both, using a small knife or a needle. Segmental fasciectomy. 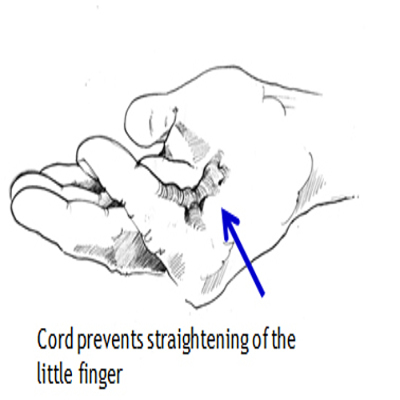 Short segments of the cord are removed through one or more small incisions. Regional fasciectomy. Through a single longer incision, the entire cord is removed. Dermofasciectomy. The cord is removed together with the overlying skin and the skin is replaced with a graft taken usually from the upper arm. This procedure is usually undertaken for recurrent disease, or for extensive disease in a younger individual and helps prevent recurrence. After surgery, the hand may be fitted with a splint to be worn at night. Hand therapy is important in recovering movement and function, especially for more extensive surgery and skin grafts. The recovery is variable with regard to the degree of improvement achieved and the time to achieve the final position. The final outcome is dependent on many factors including the extent and behaviour of the disease itself and the type of surgery required.